Clarity Eye Care (Lombard) - Book Appointment Online! 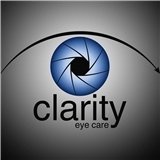 Clarity Eye Care is focused on your eye health and clarity of vision. Dr. Matthew Hendrickson's family has a long history of eye disease, which led him to pursue this career. Dr. Hendrickson takes the needed time to understand your vision needs and ensure a thorough evaluation of your eyes. He has years of experience working alongside a LASIK surgeon, which ingrained in him the importance of absolute accuracy of prescription and detailed eye health assessment. In addition to eyeglasses and contact lenses, Dr. Hendrickson offers services including an on-site eyeglass lab, specialty contact lenses, LASIK evaluations, dry eye treatments, glaucoma evaluations, diabetic exams, and emergency eye care. You will be thrilled with Dr. Hendrickson and staff's courtesy and attention to detail. It’s been 10 years since I’ve had a vision exam and my daughter needed her kindergarten exam. The appointment was made online and they called me to confirm and offered earlier times that we’re not on Zocdoc. They were accommodating to make back to back appointments so we could be seen together. We were seen right at he appointment time and they were very patient with my daughter and calming her fears. Dr. Hendrickson explained what he was doing and why. Already made our follow up appointments for next year.